Bradford’s Bianca Keener (14) gets a tip over the net on this play Monday night in a non-conference win over host Northridge. Bradford’s Macie Reck (1) puts the ball up in play for one of her teammates Monday night in a non-conference win over host Northridge. 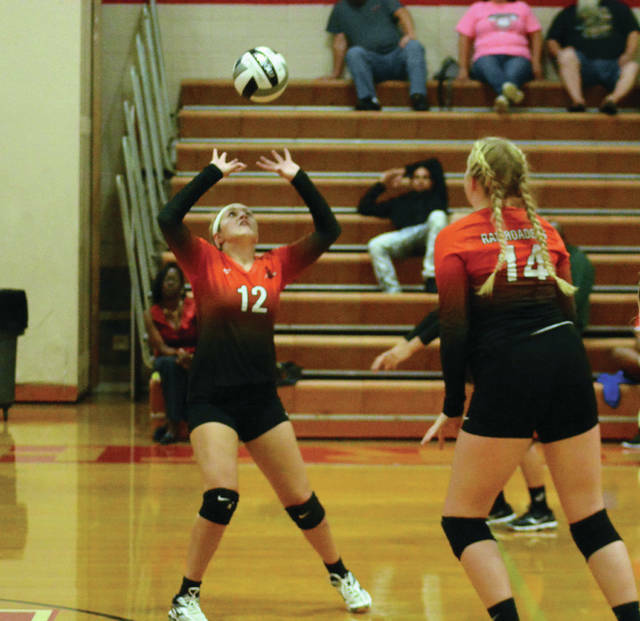 Bradford’s Cassi Mead (12) sets the ball up for one of her teammates Monday night in a non-conference win over host Northridge. 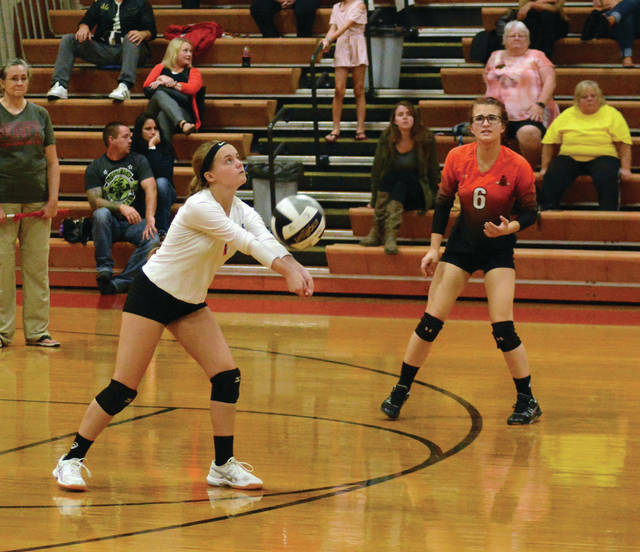 Bradford’s Erica Gaynor (8) saves a point on this play Monday night in a non-conference win over host Northridge. DAYTON – A lot of times games come down to execution. Eliminating mental mistakes, being in the right place at the right time, and making a play when you have the chance. It was not a perfect game by any means, but Bradford took care of business by ramping up their game against the SWBL’s Northridge Polar Bears. Led by seniors Macie Reck and Bianca Keener the team won by double digits in all three sets, 25-14, 25-15, 25-12. Certainly Bradford did not play flawlessly, but they made the least amount of mistakes. They kept the ball off the floor during some close volleys and only had 3 or 4 bad serves for the night. They definitely did a better job of dig-set-spike than Northridge. Macie Reck, who is currently second in the league in digs, was a major factor in keeping the ball off the floor. There were a few rough patches during the night, but the team fought through them and prevailed. In the first set, the team led 15-13 at one point and then went on a 10-1 run to easily put the Polar Bears away. In the second set, the team was up 19-10 and seemed ready to make another race to the finish. But they relaxed and gave away five points in a row due to unforced errors in play. 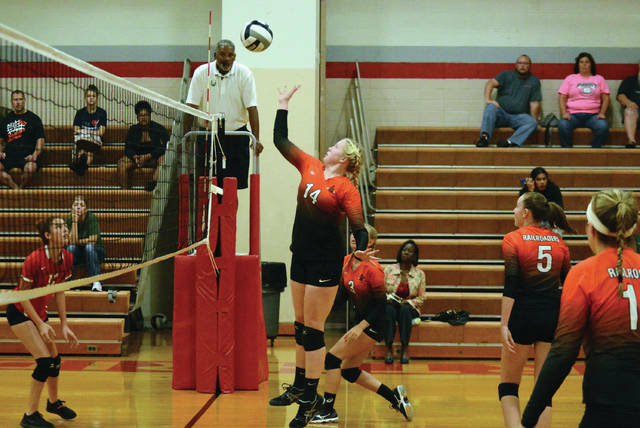 Coach Hollie Beam took a time out to set the team straight and to also halt the momentum of Northridge. It worked. The Railroaders went on a run to close out the set with Bianca Keener scoring the last two points with a pair of ace serves. “Bianca has really improved for us the last couple of years,” Beam said. “She has learned to control the ball and move her body to set up her shots. She has learned to recognize where the defense is and hit around the defenders not at them. In the last set, Bradford got off to a rocky start. They were behind by the largest margin of the night at times and seemed to be flailing. Again, coach Beam had to take a timeout to get the team refocused. Cassi Mead met the challenge and scored 2 kills in a row to tie the game at 6-all. After that the Railroaders did not look back as they gained the lead and grew it. Keener was a major factor down the stretch, scoring 6 of the teams last 10 points. Brewer controlled the serve during the last 5 points of the set. 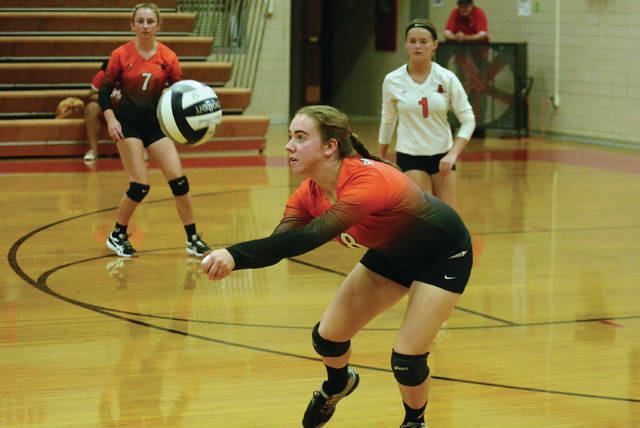 Bradford returns to league play with matches against Bethel and Ansonia. Ansonia is a familiar foe, as the Railroaders met them earlier in the season for a win. This entry was tagged Bianca Keener, Bradford Railroaders, Cammi Mead, CCC, girls volleyball, Macie Reck, Northridge Polar Bears, SWBL. Bookmark the permalink.